When contemplating what to post about this week, the decision was made for me when my husband, Travis, came home with a new Vitamix. If you read my post on dessert smoothies, you know that I’ve wanted one of these highly coveted, seemingly superhuman kitchen appliances for some time now. While my Ninja is a high performing blender, it fails to completely purée seeds and tougher fruits and veggies like blueberries and kale. Ready to make the switch, I knew that I needed to try making my super food smoothie before anything else to really put my Vitamix to the test. First, a word about some of the ingredients. 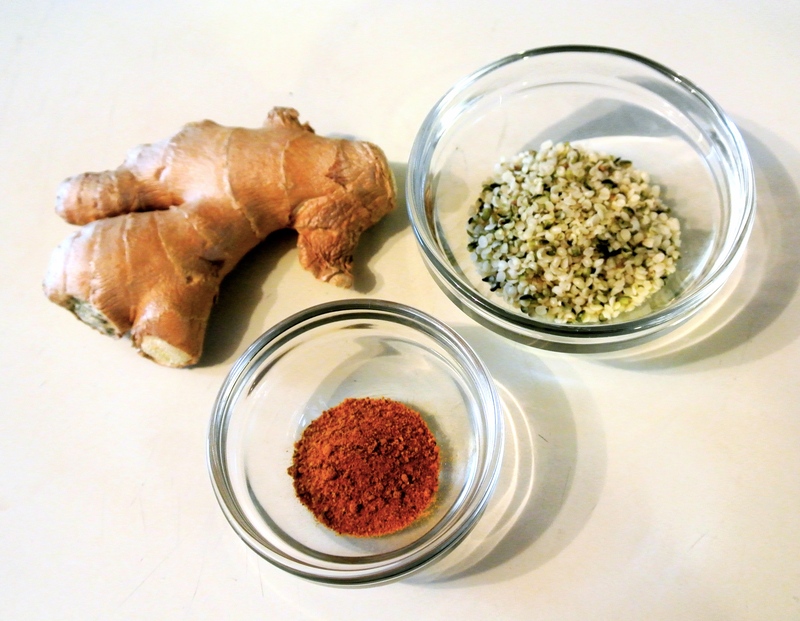 Below, I’ve pictured ginger root, hulled hemp seeds, and turmeric powder. I first learned about the wonders of ginger when I was pregnant. This refreshing and crisp root aids with nausea and digestion. Turmeric is another amazing root, but not having any on hand today, you can see that I’m using powdered turmeric instead. Turmeric is an anti-inflammatory and is great for your skin. (I use a handmade facial soap loaded with turmeric.) When it comes to including roots in your smoothies—fresh or ground—start small. Their flavors are assertive and it’s better to err on the side of caution and add more later. As mentioned in my bio, I am not a culinary or dietary professional, so I am always learning about food. My sister works for a vitamin company and serves as one of my primary sources, but I do other research, too. Thus, I’ve amended my super food smoothie formula to include hemp seeds. I’ve heard the buzzing about these seeds for some time now, but they aren’t as easy to find as seeds like chia and flax. After visiting Bob’s Red Mill in Portland (you have to go! ), I finally got my hands on a bag of them. Hemp seeds are one of the highest in protein of all seeds and nuts, and are packed with Omega-3 and Omega-6 fatty acids. This smoothie is another breakfast (or lunch/dinner/snack) you can feel good about, and is easy to share with little ones, too. My son, Nolan, drinks one every day. Enjoy! 1 cup fresh fruit –> I’m using two small bananas. 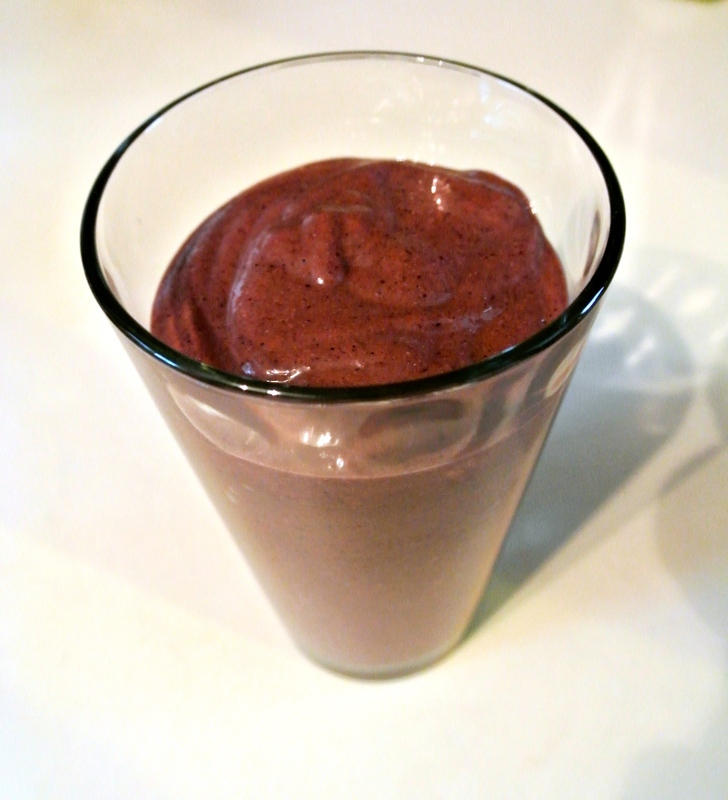 1 cup frozen fruit –> I’m using a combination of blueberries, blackberries, and raspberries. 2 cups fresh vegetables –> I’m using a variety of baby kale leaves. ¼ cup fresh herbs –> None today. I only have cilantro and it isn’t my preference in a smoothie. 🙂 I suggest parsley or mint if you have some on hand! ½ inch turmeric root –> I’m using ½ tsp dried turmeric instead. Liquid* to achieve desired consistency (optional) –> I’m using approximately 6-7 oz of freshly squeezed orange juice. *Most of the time, try to avoid using juice as it is lacking the fiber from the pulp, flesh, and skin necessary to assist the body in properly processing the sugars therein. The occasional freshly squeezed juice, pack with as much pulp as possible, is fine. Other options include unsweetened plant milk, water, or a moisture-packed fruit such as watermelon. Depending on the quality of your blender and the types of produce you are including in your smoothie, you may not need to add liquid to the mix at all. 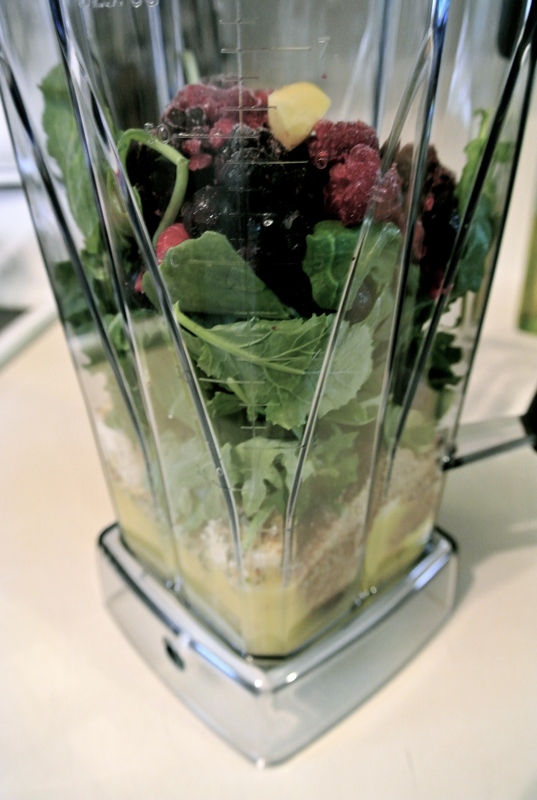 Place all items in a blender and blend until smooth. Consume immediately as some seeds, even when puréed, will continue to thicken the smoothie the longer that they sit in moisture.